My friend has a saying; Leadership cannot be demanded – only earned and deserved. 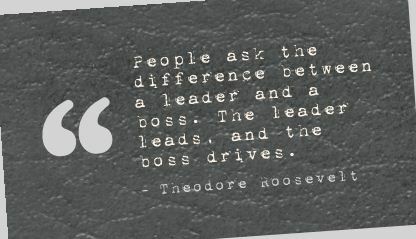 With that in mind, has anyone ever told you the difference between a boss and a leader? The boss says ‘Get here on time’; the leader gets there ahead of time. The boss makes work a drudgery; the leader makes work a game. The boss justifies or lays blame – the leader takes responsibility. Read 9 things I learned from working for a half billionaire here. Read 4 things I learned about leadership while running a business here. That’s a great list…I’m going to send it to my husband…since his job has him in a leadership role. Great work on differ. b/w boss & leader…..
Well done! I enjoyed reading this 🙂 Will be coming back for more! 1. enables people, 2. shares vision, 3. verifies and confirms vision with feedback, 4. seeks and clarifies how the team works, 5. sees breakdowns as opportunities, 6. tries ideas and solutions, 7. rewards poeple, 8. shares credit, 9. supports effort and communication, 10. says thank you and shows appreciation, gratitude. I certainly want to be a Leader not a Boss! Let’s rock on!